Being a first time mom with so much on my plate, I wasn't sure how I was going to feel about adding something to my daily routine. Beautycounter, with the help from my friend and Consultant Lauren, showed me that this is an important step that everyday soap can't conquer. This is something that makes me feel and look good. Ever since becoming a mom, I think like many others, you really start to value what you are putting in and on yours and your babies bodies. You want to live the best life you can and that means putting in the effort to find what works best for you both. There were some products that I really loved and some that I could do without solely for not having enough cabinet space, because lets face it... there are never too many beauty and skincare products. Sweet Lauren sent me the Essentials Collection, The Baby Bundle and The Charcoal Bar. All items that I would have personally purchased simply from the outstanding reviews and product descriptions. I have always had great skin, its not really been something that I have had to stress over as many of my friends and family have had too. I have had a simple regimen of washing my face nightly with a face wipe, rinsing with my Clearsonic and heading off to bed. There have been a few occasions where I forget the washing process all together, but this is rare as I can't stand a makeup stained pillow. But since getting pregnant, my skin went dull and dry, I also had an unexpected wave of bumps that appeared on my arm the last week of pregnancy that did not fade until a week following my Beautycounter product arrival. The Charcoal Cleansing Bar: This bar was nothing like I thought it would be, I am currently using Dr. Brite's charcoal toothpaste and it does not lather which I prefer, I expected the bar to act the same but maybe make my face feel a little dry. It does just the opposite... The bar allows my face to get naturally clean without feeling dried out and also ended up making my dull skin brighter! I will definitely be buying this in bulk but will also be trying the Purifying Charcoal Mask. 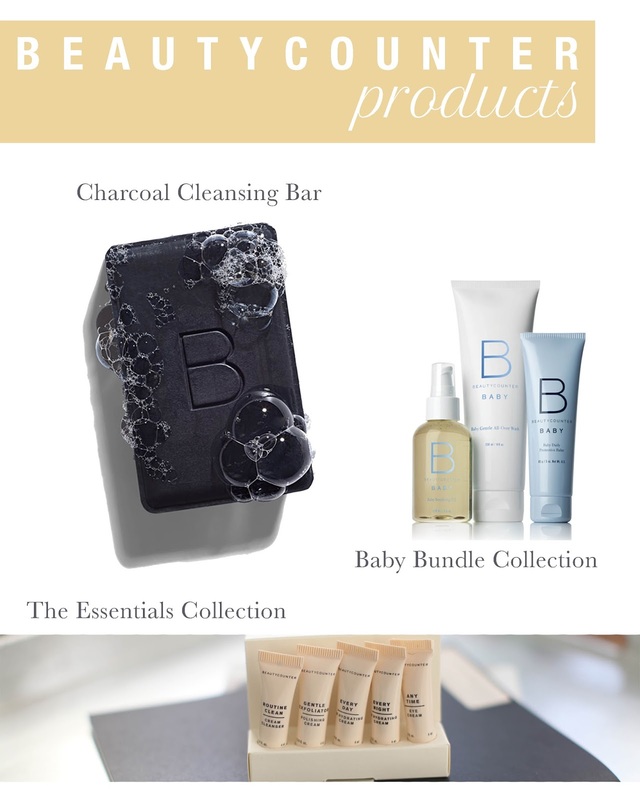 The Baby Bundle Collection: I am very selective when using products on baby Mase simply because there is nothing worse than a baby breakout since they can't express what is wrong just yet, other than with tears and sleepiness. The Soothing Oil is probably my favorite of all the items since I still only wash sweet Mason a few times a week but I use the oil about once a day... until I ran out. All of the products are super sensitive and Mason didn't seem bothered by any of it so I believe it was a blessing! The Essentials Collection: The Routine Clean soap was mostly used at night for me. I replaced my Clearsonic soap with this and it has made my skin so, so smooth. The creams replaced my everyday face lotion + The Eye Cream has actually been used as my eye primer and I don't think I could use anything else now! - All of the products are programed to work together. Much like using Neutrogena, Rodan + Fields, Proactive, Covergirl... when you use products that are of the same brand they are bound to work better. This has the major advantage because it's all natural, safe for mom and baby while also being safe for sensitive skin. - The products are selected specifically for you and your skin type. By working with a Consultant you are allowed the opportunity to find products that work for you... from someone who knows and cares about you and the value of your skin. *For me, this is a pro... I enjoy being an online shopper rather than having to go to the store at the last minute. Have you tried any Beautycounter Makeup products? Share in the comments below, that is my next splurge! Excited to keep trying, loving and sharing Beautycounters natural beauty + skincare products!